Last week we learned about Gideon, and Jonathan was equally enthralled with this story as he was with Joshua. I suppose there's something about boys and soldiers! This is another book from the Bible Time series that we recently discovered. 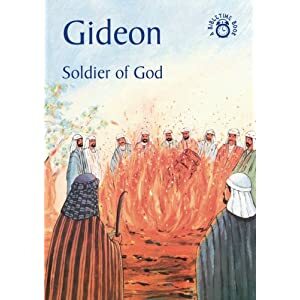 It covers all aspects of the story of Gideon: Gideon's call, Gideon's fleece, reducing the size of Israel's army, and God giving Israel the victory. We divided the book up into three readings and this seemed to work well for Jonathan. This was Jonathan's favorite. 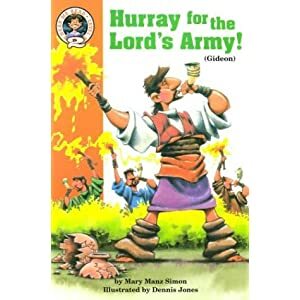 This book covers the story of Gideon, but leaves out Gideon's wanting a sign from God. It's an easy reader story, but full of action. Jonathan loved pretending to blow a trumpet and shouting "A sword for the LORD and for Gideon!". He was so cute! Jonathan requested this book several times throughout the week. We learned the song "I'm in the Lord's Army!" along with the actions. Jonathan even taught this song to his Sunday school class on Sunday! I cut out the base of a sword from black paper and the base of a torch from brown paper. Then I had Jonathan glue them down onto his paper. For the torch, we ripped yellow, orange, and red tissue paper and glued them onto the base to make "fire". For the sword, we used aluminum foil to make a blade. This really helped Jonathan remember our lesson and he was so proud to show his artwork to daddy! Now we're moving on to Ruth... we're just zipping through the Old Testament! Oh Gideon will be fun when we get to it. I love this book on the 10 Commandments. I put it on my wish list. Very creative with your Gideon crafts - nice! This is great! We have just started doing the story a week thing and I think it's a great idea. will have to keep an eye on what you get up to for ideas! Hi there! I am visiting via ABC & 123 and am delighted to have discovered your blog! I am currently working on a weekly Bible story/biblical character traits program for my little ones, and you have lovely ideas - I'll be back for more!! Love your Gideon craft!